Born in Three Oaks, a small town in western Michigan, Patton lived his early years there with his mother, brother and maternal grandparents. He never knew his father. His family belonged to a strict Methodist church. He attended two church services on Sundays, morning and evening, and in between the adults allowed no secular amusements. He recalled hearing cheers and shouts from the neighboring baseball field on Sunday afternoons, wanting to join in but not allowed to go. When he was eight or nine Patton moved with his mother and brother to a working-class suburb of Chicago. There he graduated from high school, the first in the family to do so. He went on to junior college, working at night to finance art lessons on Saturdays. Thus began his lifelong passion for the visual arts. At the age of 20 he began writing poetry. He completed his college work at Eureka College, from which he received a B.A. in 1937. Though he would have liked a career in art, Patton chose ministry as a way to support his family and make use of his talent in writing and speaking. While serving several Disciples of Christ churches in small mid-Illinois towns, he developed a talent for beautiful extemporaneous prayer. At the same time he commuted to the University of Chicago to work on a degree in theology. There he studied with such outstanding teachers and humanists as Edward Scribner Ames, Henry Nelson Wieman and A. Eustace Haydon. Haydon, who spoke in poetic language with a beautifully-modulated voice, influenced Patton greatly. He showed the younger man that religion could be much more than a set of dogmas, that it could include all the arts as well. Patton received an M.A. in 1939 and a B.D. in 1940. 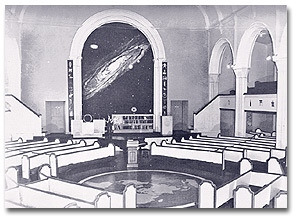 In 1942 Haydon suggested that Patton, now a confirmed humanist, apply for the open pulpit of the First Unitarian Society of Madison, Wisconsin. Patton did so, was called, and served until January, 1949. He helped the Society obtain the services of famed architect Frank Lloyd Wright for the design of its new building. While in Madison, he published his first three books: Strange Seed, 1946, a slim volume of lyric poetry; Beyond Doubt, 1946, a collection of radio talks; and Hello, Man, 1945, poetry and poetic prose which celebrated humanism and naturalism in religion. The latter established him as a major spokesperson for this still new approach to religion. 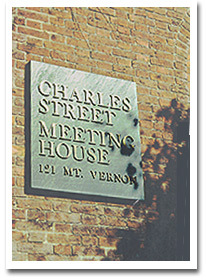 The Charles Street Meeting House. Patton threw himself into this venture with both mind and body. 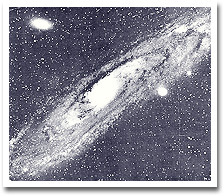 Colleague Charles Reinhardt recalls coming into the Meeting House one morning and finding him on his knees painting a mural of the Andromeda Galaxy for the proscenium. Says Reinhardt, “He looked like a happy kid building a terrific model airplane.” His enthusiasm was contagious. Although the Meeting House congregation was never large, a dedicated core group supported this new realization of religious art, coming regularly to Friday evening work nights. Among others, two talented artists, brother and sister Ralph and Charlotte Edlund, designed and constructed a series of large bronze symbols illustrating a broad variety of human endeavors. 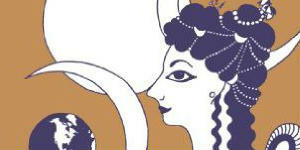 Today the symbols are on display at Starr King School for the Ministry in Berkeley, California. Together, Patton and his congregation built an outstanding art collection. 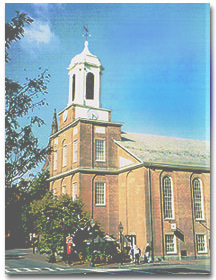 Patton’s outspoken and provocative preaching offended many, including his more conservative colleagues in the Massachusetts Universalist Convention. He jousted verbally with other ministers and religious leaders. His inability to be a pastoral minister drove parishioners away. His single-mindedness led him to ignore others’ concerns and to respond with irritation to their needs. Often tendentious, he refused to compromise or even listen to other points of view. In practice, as a minister, he charged ahead with his own projects and relied on lay leadership to take care of church finances and membership growth. A Religion for One World, 1964. Patton was twice married. 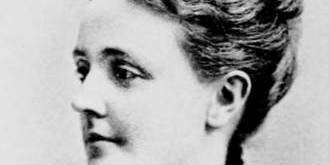 In junior college he had met and married Elizabeth Pfeifer, with whom he had five children. After being divorced, he married Mitzi Anderson around 1960. They had two children. 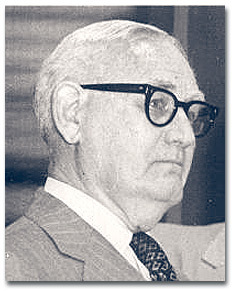 In 1964 the Unitarian Society of Ridgewood, New Jersey invited Patton to become its minister. At this time he felt the need of a larger and more secure income and a home for his family outside the center city. For a while he served both congregations, coming to Boston once a month; then reluctantly left the Meeting House. In Ridgewood Patton reconstituted Meeting House Press in order to publish more of his works. The Sense of Life, 1974, was a sensitive look at the natural world and the integral role of humanity in it. A Religion of Realities, 1977, summed up of Patton’s religion and philosophy of life.The meditation manual, Songs of Simple Thanksgiving, 1978, celebrated simplicity in a range of items, from the ordinary elegance of handmade tools to those seemingly complicated and mysterious phenomena, human beings and stars. All in all, Patton wrote nearly thirty books, as well as anthologizing an immense amount of humanistic-oriented poetry from around the world. As a minister, Patton was an iconoclast. He disdained any special treatment as a clergyman. 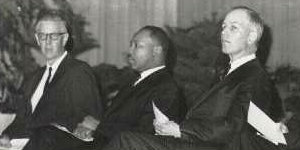 He would not call himself “Reverend,” saying that he was no more to be revered than anyone else. He never used the honorific, “Doctor,” though entitled to do so by an honorary degree. He refused to wear a pulpit robe, even at his own installation service. 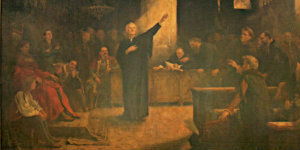 He did not preach sermons, he gave addresses, and not in a church sanctuary but in a meeting house. The interior of the Charles Street Meeting House. Patton received many honors. They included the Religious Arts Guild award in 1964, an honorary Doctor of Humane Letters from Meadville/Lombard Theological School in 1967, the Bragg Award for Distinguished Service to Humanism in 1980, and the Unitarian Universalist Association’s Distinguished Service Award in 1986. Let us worship with eyes, ears, and fingertips. Let us love the world through heart and mind and body. Let us worship, and let us learn to love. — By Maryell Cleary. From Dictionary of Unitarian Universalist Biography, which also contains recommended reading. 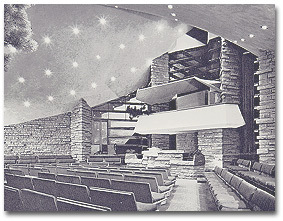 The interior of the Madison, Wisconsin, Meeting House, designed by Frank Lloyd Wright. His most enduring contribution was to persuade the congregation to sell its venerable property just a block off Capitol Square and—most important—to engage its own distinguished member Frank Lloyd Wright to design a new Meeting House on what was then considered Madison’s far West Side. Mr. Patton voiced his enthusiasm for this project in the June 1947 issue of the Christian Register, the monthly magazine then published by the American Unitarian Association. 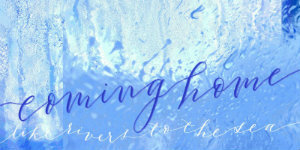 Noting that the new Meeting House would reflect “Mr. Wright’s theories of organic architecture,” he picked up the architect’s theme that the triangular roof would provide an “expression of reverence without recourse to the steeple,” that “the building itself . . . says what the steeple used to say, but says it with greater reverence. — From Landmarks in the Life of the First Unitarian Society of Madison. 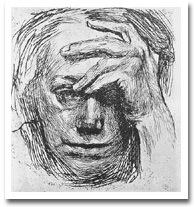 Kollwitz was one of our own. Her father and grandfather were liberal ministers. 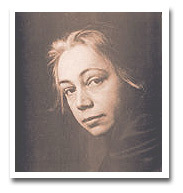 She was an artistic prophet of liberal religion, of humanity, freedom, motherhood, the advancement of the working class, the end of peasantry, the condemnation of war, compassion for death. 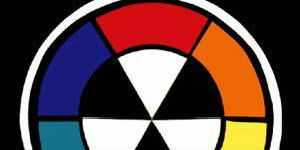 The collection is great and powerful preachment of our essential message and concerns. If we have any essential religious art, this is it. Woodcut, The Volunteers. 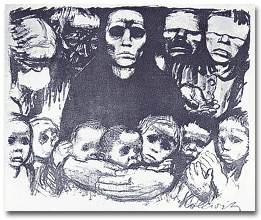 This is the second work in the “War” series, which was Kollwitz’s protest against war, following her experience in the First World War, and the death of her son in its early stages. 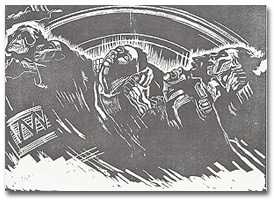 Etching, The Prisoners. This is the last etching in the series on the “Peasants War.” It shows the prisoners tied and herded together after the defeat of the rebellion. The artist’s first great series of prints was on the “Weaver’s Revolt,” and this series on the Peasants War followed. The poverty and oppression suffered by the lower classes was a constant theme in her art. 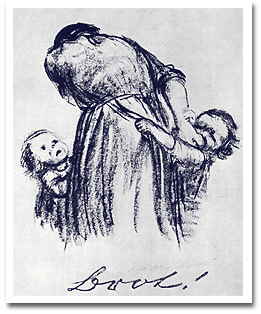 The congregation sold the Kollwitz prints through an art dealer in order to pay its expenses. – From “Meeting House Days, 1962-1968,” a manuscript by Alan Seaburg. 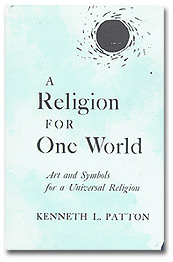 Ken Patton’s ongoing lifelong contribution of original worship materials is symbolized by several selections in the current Unitarian Universalist hymnal, Singing the Living Tradition: “We are the Earth” (303), “The Blessings of the Earth and Sky” (308), “The Earth is Home” (310), “Doxologies” (378, 379), “Let us Worship”(437), “We Arrive” (443), and “This House” (444). His life continues in our acts of singing and seeing and reading. 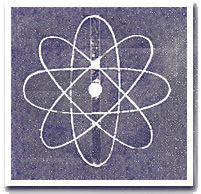 These two symbols, the mural of Andromeda and the construction of the atom, formed the poles of the symbolism in the Meeting House. Cleary, Maryell, ed. Wonder of Life. East Lansing MI: Meeting House Press Revisited, 1997.